LsODN Preparation Kit| BioDynamics Laboratory Inc. The Long ssDNA Preparation Kits (LsODN Preparation Kits) give a simple and easy method for generation of a long single stranded DNA (within 1,500 base or within 3,000 base). A long ssDNA prepared by this method has defined sequence and length because it does not include inside mutation and terminal deletion caused by PCR, exonuclease side reaction, not high-fidelity reverse transcriptase reaction or not high-fidelity synthetic oligonucleotides. The procedure of this method is almost the same as the method to obtain dsDNA fragments. The DNA of interest is cloned into a plasmid. The resulting plasmid harboring the DNA is digested with a pair of two nicking endonucleases or a combination of a nicking endonuclease and a restriction enzyme. The nicked plasmid is denatured by mixing with Denaturing Gel-Loading Buffer and then subjected to agarose gel electrophoresis. The band corresponding to a long ssDNA is excised and extracted with commercially available kits. A long ssDNA (within 1,500 base or within 3,000 base) can be prepared. A long ssDNA has defined sequence and length. Simple principle and easy procedure. High yield and high quality. 4. The band corresponding to a long ssDNA is excised and extracted. A 1.5 kb DNA fragment of interest was cloned between the Nt.Bsp QI and the Nb. 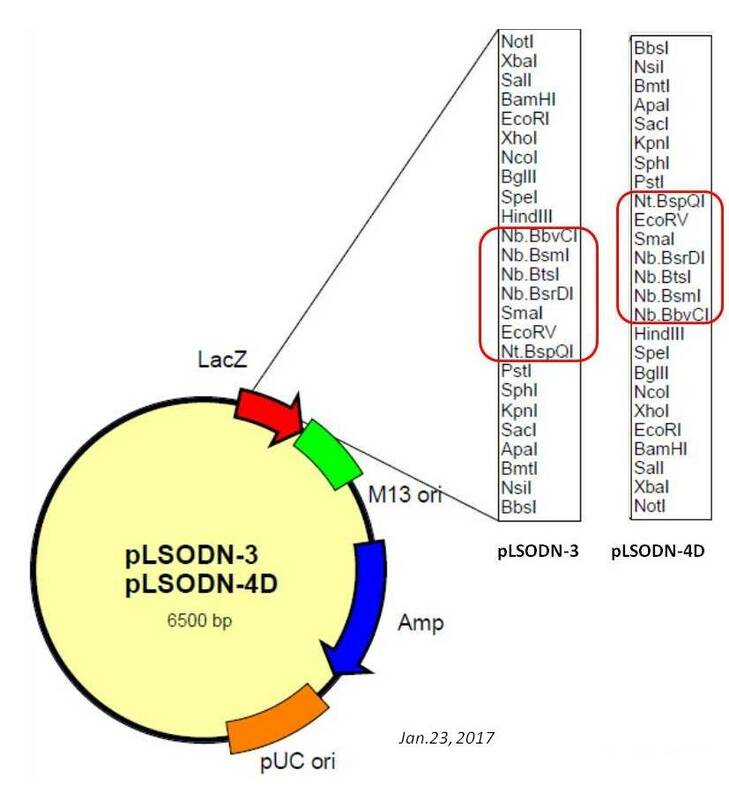 Bsr DI sites of pLSODN-1. Similarly, a 3.0 kb DNA fragment of interest was cloned between the Nt.Bsp QI and the Nb. Bsr DI sites of pLSODN-3. 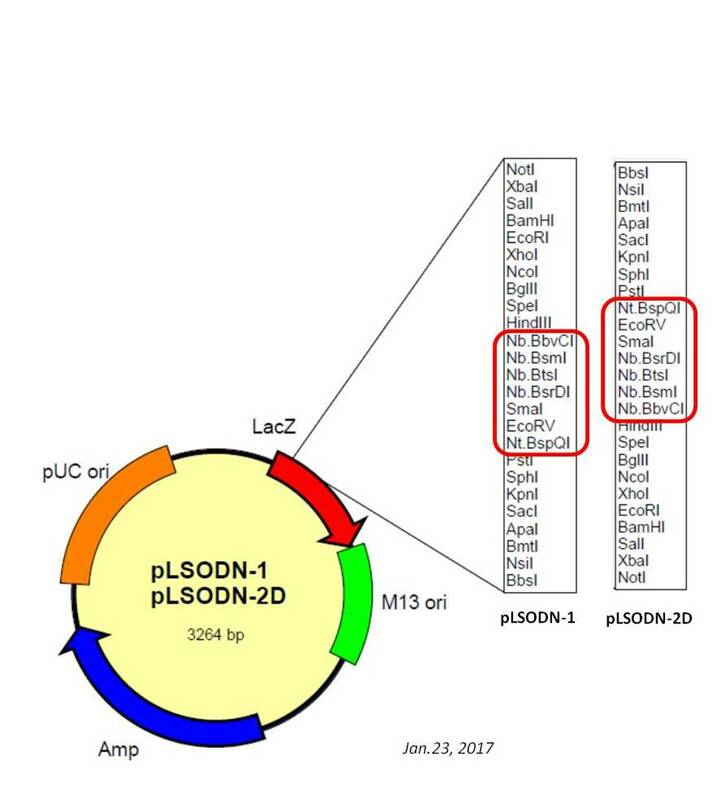 The resulting plasmids were digested with Nt.Bsp QI and the Nb. Bsr DI. The double nicked plasmid was mixed with Denaturing Gel-Loading buffer (DS611) and heated, then loaded to conventional non-denaturing agarose gel electrophoresis. The band corresponding to a long ssDNA is excised and extracted. ssODN-mediated knock-in with CRISPR-Cas for large genomic regions in zygotes. Yoshimi K, Kunihiro Y, Kaneko T, Nagahora H, Voigt B, Mashimo T. (2016) Nature Communications. 20;7:10431. To access the full sequences of these kits, you need password! The password is shown in your datasheet or the box. If there is a problem, please do not hesitate to contact us.